The Bedford/St. 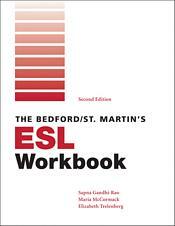 Martin’s ESL Workbook by Sapna Gandhi-Rao, Maria McCormack, and Elizabeth Trelenberg, provides ESL students with a broad range of exercises. This outstanding resource covers grammatical issues for multilingual students with varying English-language skills and cultural backgrounds. To reinforce each lesson, instructional introductions are followed by examples and exercises.